Historic grand adobe located two blocks from Taos Plaza on .52 acre just down the road from the Harwood Museum of Art. 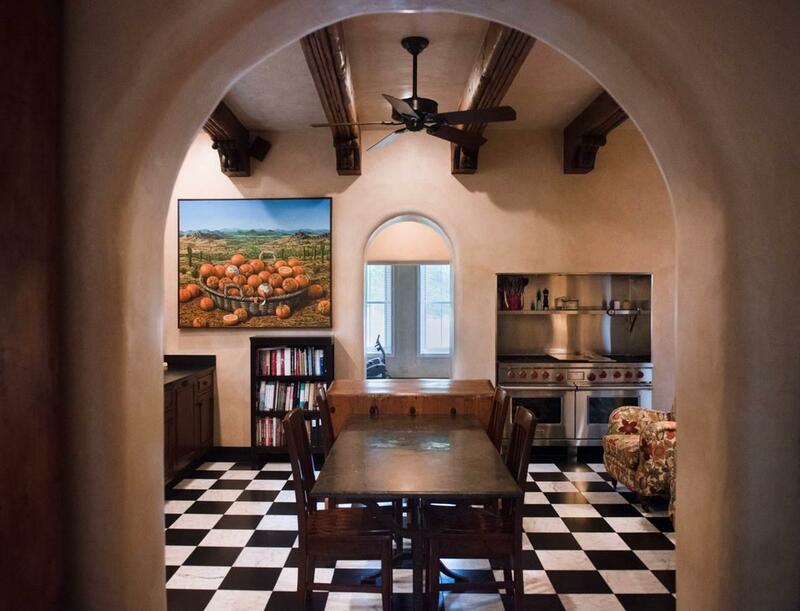 Built in pre-1870s, restoration completed in 2009, this house was carefully restored to a standard consistent with products of the 1920s available in Taos with the advent of the railroad. 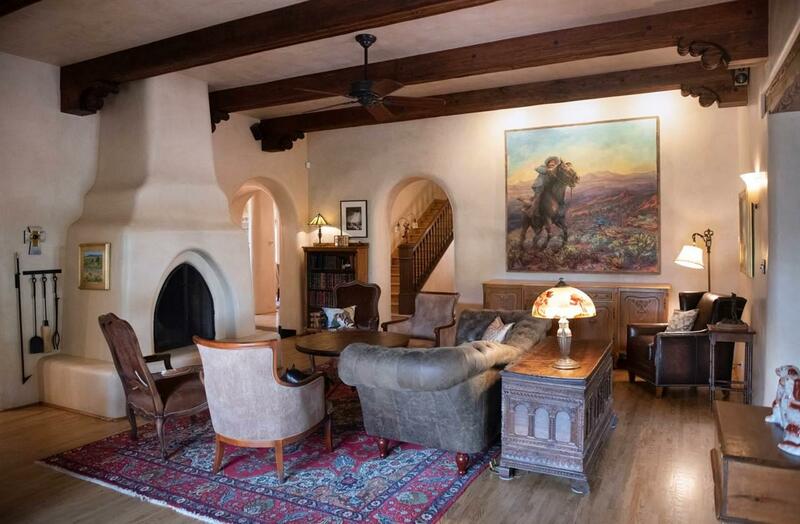 With exception of the historic adobe bricks, the house has all new plumbing, electrical, radiant in-floor heat, windows, doors, fixtures, appliances and finishes. 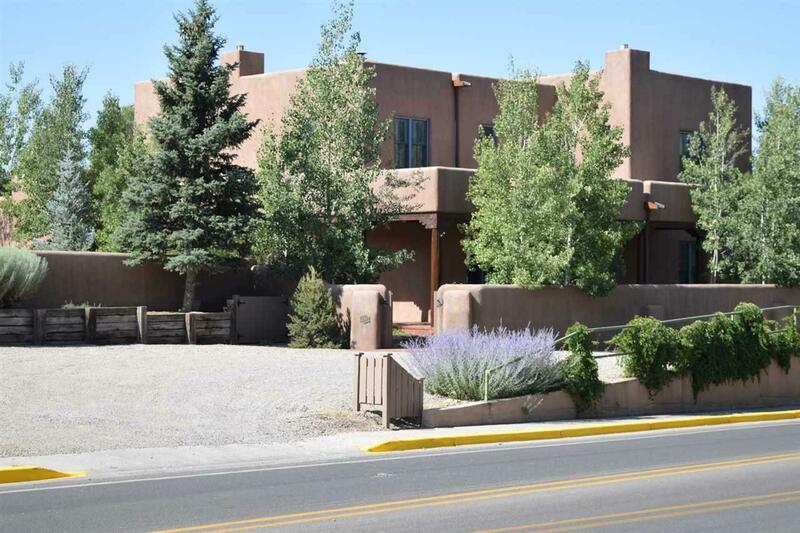 The two story 5473 square foot five bedroom, five full bath and one half bath main house beautifully combines old Taos and comfortable elegance with modern amenities. 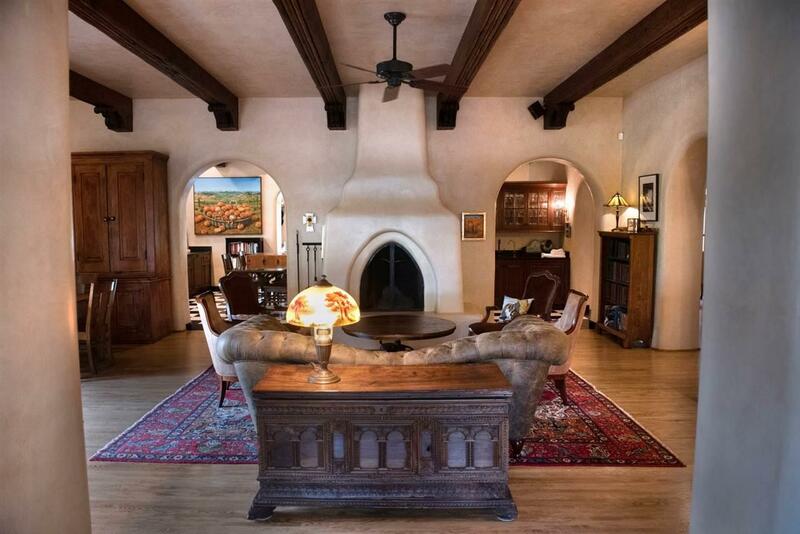 Hard finished plaster walls throughout, hand carved beams by Chris White in the common areas newly constructed replicas of the original beams, 11 foot ceilings on the main level and 10 foot ceilings on the second level, vigas and coved plaster ceilings in the bedrooms. Other details include one and one quarter inch strip oak flooring throughout, marble and granite tiles in the kitchen, small black and white tiles in various patterns throughout the baths, period plumbing fixtures, glass door knobs, push button light switches and steeple door hinges. This is a great house for entertaining. The large dining room will accommodate a table for 12. Separate butlers pantry provides room for a large variety of dishes. The rear patio and grass lawn backyard are very inviting for parties and have accommodated over 100 people. There are extensive covered portals in the front and rear of the house. The wine cellar has a built-in cooler and wooden racking for over one thousand bottles of wine. There is storage room on top of the racks for 18 additional cases of wine for a total capacity of over 1,250 bottles. Gourmet Kitchen with living area includes a 60 dual fuel Wolf range with a grill, griddle and high capacity built-in stainless steel ventilation system. Two Asko dishwashers are a real asset for entertaining. The high capacity Sub Zero refrigerator and separate freezer are contained in their own room adjacent to the kitchen to preserve the look and feel of the 1920s in the kitchen. TV and receiver are hidden in cabinets. Enjoy cooking, watching TV and listening to music in the easy chairs in the kitchen. Separate pantry and pot rack provide lots of storage area. Four bedrooms with ensuite bathrooms that include double sinks and separate toilet room and shower. The fifth bedroom (currently used as an exercise room) contains a claw footed cast iron tub and period plumbing fixtures. Upstairs media room equipped with modern audiovisual equipment that is very well concealed. The 1,075 square foot caretaker's apartment has high level flooring, finishes and appliances. Plus large walk-in closet, full bath and a large loft bedroom with excellent views. The apartment can be a source of additional income, a caretakers cottage or both. The oversized two car garage is approximately 960 square feet with in-floor radiant heat, a workbench area, large storage closet, a dog/boot/sports equipment shower and a mop sink. Floor drains under each parking space assist in cleaning mud and cinders from the garage floor. The backyard is fenced and has a turf area. Walled landscaped areas and trees create a private and quiet sanctuary right in the heart of town!